You are here: Home / Galaxy Note 4 How-To Guides / How to customize Galaxy Note 4 notification tone? 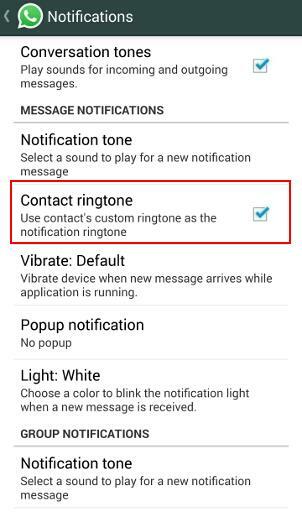 In addition to customizing the Galaxy Note 4 ringtones (see this guide), you can also customize Galaxy Note 4 notification tone easily. This guide will show you how to set customized message tone for some special contacts and how to use yoru own audio file as notification tone. How to customize Galaxy Note 4 notification tone by changing the default notification tone? The default notification tone (whistle) in Galaxy Note 4 is not bad. But if there are any whistles in a public area, you may not know whether it is from your Galaxy Note 4. So, the first thing you can do is to customize Galaxy Note 4 notification tone by choosing a different one. Go to Settings—Sound, tap Notifications as shown below. 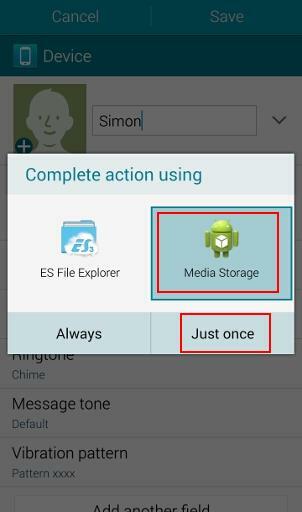 If you are asked to select an app to finish the action, choose Media storage – Just once as shown below. Now, you can select one of the available notification tones in your Galaxy Note 4. Tap any of them to choose it as the new default notification tone. For example, I choose Beep Once. Then tap Done. Once you are brought back to the Settings—Sound page, you will notice the new default notification tone was assigned as shown below. 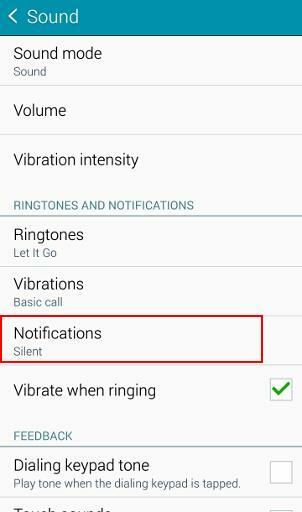 In this way, you can customize Galaxy Note 4 notification tone by choosing any of the pre-installed notification tones. How to customize Galaxy Note 4 notification tone with your own audio files? You are NOT limited by the pre-installed notification tones in Galaxy Note 4. You can customize Galaxy Note 4 notification tone with your own audio files (e.g., music, your own voice recording). You can use any audio files (as long as they can be recognized by Galaxy Note 4) as your notification tone. The audio format can be mp3, m4a and many others. The audio files can be in the phone or in your PC. 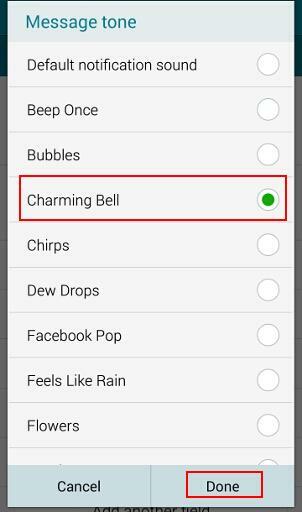 So, this is the most popular way to customize notification tone because you can use very unique notification tones, not just the pre-installed ones. You just copy the audio files to the Notifications folder in the phone storage. For example, if the MP3 file is on your PC, you can connect your Note 4 to the PC with the USB cable. 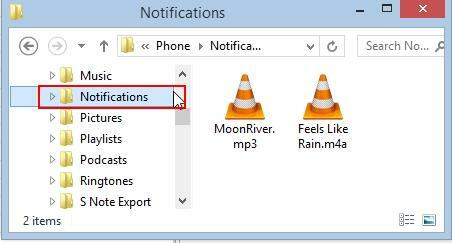 Once the phone is recognized by the PC, you can copy the MP3 file to the Notifications folder in the phone storage as shown below. 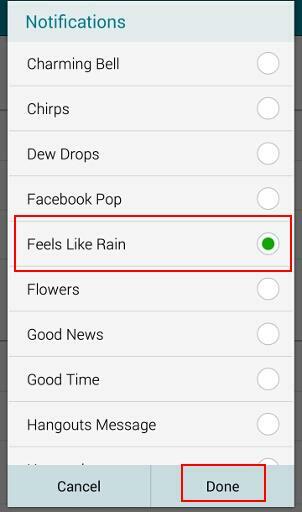 Once the audio file, e.g., the m4a file “Feels Like Rain” is put in the Notifications folder, it can be used exactly as the pre-installed notification tones. You can go to Settings—Sound—Notifications. Choose this m4a file and tap Done to set this audio as the default notification tone as shown below. Now, this audio file becomes Galaxy Note 4 default notification tone. 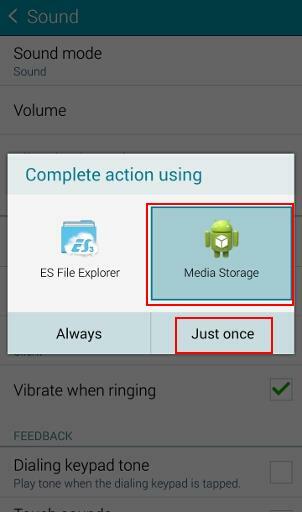 If the audio file is in the phone, you may use ES File explorer (or some other apps) to set it as the notification tone directly. Of course, you can use My Files app to copy the audio file to the Notifications folder. 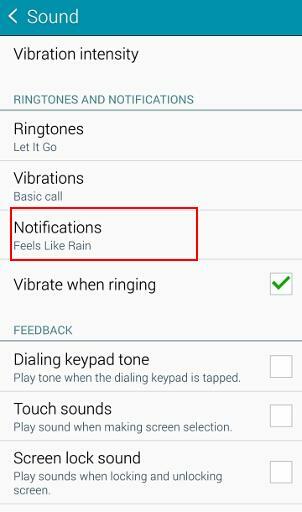 How to customize Galaxy Note 4 notification tone for your loved (or special) ones? You can not only customize Galaxy Note 4 default notification tone, but also customize notification tone (message tone) for individuals in your contact list. So, each contact can have a special notification tone so that you can easily know who is messaging you without checking the screen. Start the Contacts app on your Galaxy Note 4 and open the contact. Tap the pencil (edit) button in the top of the contact as shown below. Tap “Add another field” as shown below. Check Message tone and then tap OK. If you are asked to select an app to finish the action, tap Media storage, then tap Just once as shown below. Now select the desired notification tone foe this contact. You can choose one notification tone from the available notification tones, which includes both pre-installed notifications tones and any audio files in the Notifications folder. Once selected, tap Done to return as shown below. You can notice now the Message tone for this contact is customized to the tone you selected. Please remember, you are still in contact editing mode. You must tap Save in the top right as shown below to save the modifications. Otherwise, nothing will be changed!!!!!! After saving the modifications, you now can find the message tone is customized as shown below. What about notification tone of apps? Most apps use system notification settings. But some apps may have their own settings. 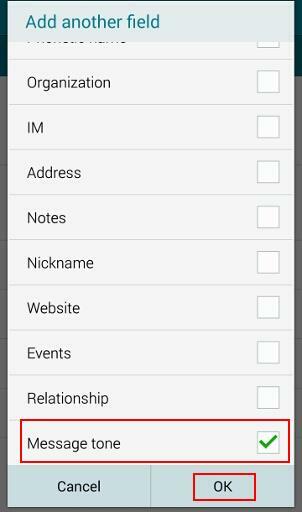 So, you need check individual apps if it has its own notification tone setttings. 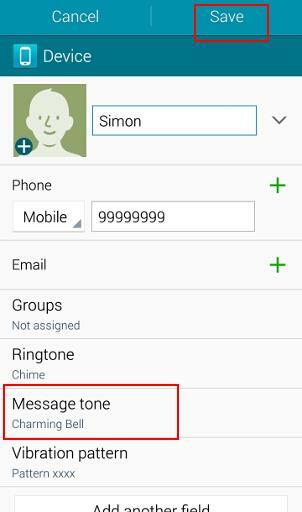 How to customize WhatsApp notification tone for individual contact? For WhatsApp messages, you can customize the notification tone for each contact so that you can easily know who is messaging you. 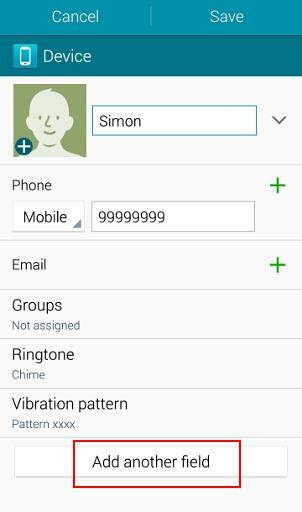 WhatsApp can use the ringtone settings in your contact. Please note WhatsApp does not use the message tone in the contact. This can be a bit confusing, because you may have problems to know whether the contact is calling you or messaging you through WhatsApp. Tap the menu key (3 vertical dots in top right). Tap Notifications as shown below. Tap Contact ringtone to check it. 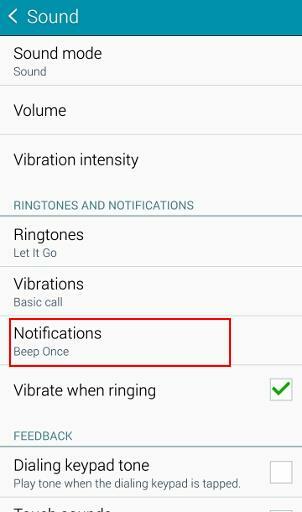 Can you customize Galaxy Note 4 notification tone? Can you set different message tones for some contacts? If you have any questions to customize Galaxy Note 4 notification tone and messages tone, please let us know them in the comment box below. We will try to help you find a solution. You can assign different message notification tone for individual contacts. In contacts app, open the contact, tap EDIT, tap more, you can then set message tone for those contact. I have just customised my notification tones so I can personalise my contacts message tones with the tones I have downloaded. Thank you soooo much for explaining it in simple terms of how to do it with the my files app. I am getting so irritated. I have set the notification tones for my individual contacts, but yet I keep hearing the default when a text comes in…. What is going on??? Are you using the default Samsung messages app? Some carriers may customize the messages app and therefore this feature will not work. my galaxy s4 does not have an option for “Message Tone” when I add another field. What’s up with that? I really need to assign certain tones to contacts (work people) who text me. Thanks! Did you try to update the phone to latest firmware? How do I set a personalized notification tone for my calendar events? You can set notification tone for calendar events. But you cannot set different notification tone for individual events. In S Planner, tap more in top right, tap settings -notification – notification tone. So the notification tone for calendar events will be different from other notifications. How can I turn off all audible notifications for a specific contact? I want to hear my regular contacts, but for one contact, I do not want to hear notification when he calls or text me. Then, you can add the contact to Auto reject list. In contacts app, open this contact, tap the menu button (3 vertical dots in top right), then tap “Add to auto reject list”. That’s what I did in the interim, but I would still like to see a visual notification when he texts me or calls me. I just don’t want an audible notification. You can record a very short audio (just cover the mic) with voice recorder app on the phone. The use it as the ringtone and message tone for this contact. 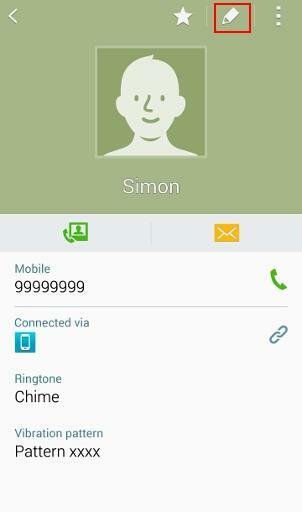 Unfortunately, Galaxy Note 4 does not offer silent or none as a customized ringtone for contacts. Okay, and thank you very much Simon. I have done everything to set up individual text message+ notifications for contacts & I cannot get it to work. Notification tone customization only works for Samsung’s messaging app. Is there a way to have one sound for your notifications, and one sound for when you get a text message? I use to be able to do this on my Galaxy phone, but can’t figure it out on the Note 4. Yes, you can set a different notification tone fire messaging app. In settings – application settings – messages – notifications – notification sound. You can choose a different sound from the default notification tone. You can access the settings inside messages app. 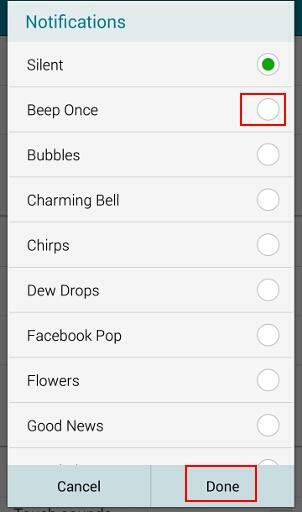 You can even set different message tone (in addition to ringtone) for different contacts as shown in this guide. On my note 4 the message tone wouldn’t change from default even though it was saying that it had, I found that when I went into ‘Messages’ and clicked on the 3 dots on the right hand side there was a drop down menu, from here go to ‘settings’, ‘notifications’ and the ‘notification sound’ and select the sound you want. This has now changed the sound to the one that I want and only for messages not every other notification. Some apps have own notification settings. You need check the settings in such apps as what you did. My Note 4 keeps sounding the default notification tone I’ve set for notifications but when I check my phone, there are no new notifications. I have also shut off the notification alerts for most of my apps except Facebook, Whatsapp and text messaging (all of which I have set up personalised notification tones). I’m really confused by this default notification tone that keeps sounding but just don’t know where it may be coming from. You can try to reboot Note 4 into safe mode to see whether you still have the problem. You may refer to this guide on how to reboot Note 4 (it was written for S5, but it works on Notye 4 identically) into safe mode. If the problem disappear in safe mode, it is very likely caused by some apps you installed. thank you if you can help and still thanks for your time if not. what do you want to do? What’s the problem when trying to do it? You just install Kies 3 for your Mac. Then when you connect note 4 to the mac, it should be recognized just like as a usb drive. In the email app, You can set notification tons for each account. 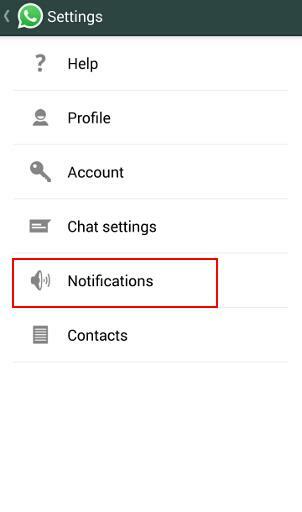 For global (default) message notification tone, you can set it in settings–Application settings–Messages–Notifications -Notification sound. If you need different message notification tone, please follow the guide. Id like to know how to change the notifiacation for voicemail, because right now my sms and voicemail have the same tones. Thanks in advance. I’ve done everything you said to change individual’s notification tones. I’m not sure what I’m doing wrong but it will not work for me. The notification tone setting for individuals is for Samsung messages app only. 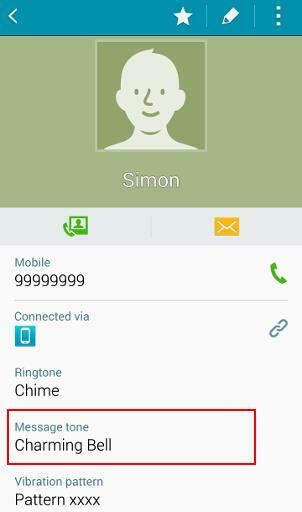 What notification tone is the phone using when getting text messages form these contacts? How can I customize WhatsApp notification tone for individual contact, different from the contact’s ringtone? I don’t think WhatsApp provides such an option. You can only choose between the default notification tone and contact’s one. It would be nice if the Galaxy Note 4 would allow you to set up different sound notifications for different apps or different email accounts (e.g., AOL, Yahoo, etc.). I want to receive notifications for my work email, but not AOL. The AOL does not allow for setting the notifications. Android allows apps to set this. It is up to the app developers to include such features or not.